Happy Thanksgiving! Hope you're enjoying the holiday, all you who are celebrating today. Autumn is always so busy for my work and I had a bonus trip out of town last week. So I'm extra- glad to be home, with extended family visiting, cooking and eating up a storm, and taking some time off. I am surprised in the best way at the responses to the coat/dress in my last post! I figured there wouldn't be (m)any polite comments, only from the few who truly appreciated it. I didn't think it would see much support, and I appreciate every comment! When faced with unavoidable opposition I somehow feel fine, but I prefer it when everyone is happy with my work. It is cooling down 'round here so I might get to wear it soon! How much my tastes have changed in 19 years! I don't wear drop-waists anymore, my sewing is pretty void of frou-frou, and I don't think a shred of this dress includes natural fiber. I hope you keep the awesome ruffles around the shoulders! They're fantastic. those shoulder ruffles are TO DIE FOR. 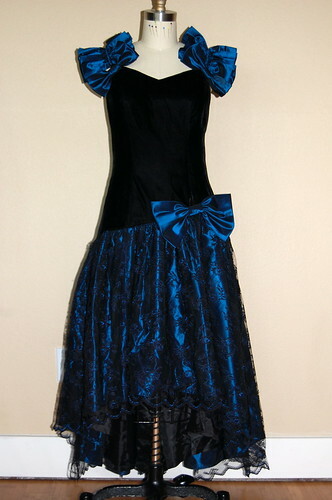 I do love that blue color, especially as a holiday dress for Christmas and New Year's parties. Not sure how you feel about this, but what about making it strapless? Maybe with a little fitted shrug or capelet along the same lines as your last one? Good luck, can't wait to see what come out! 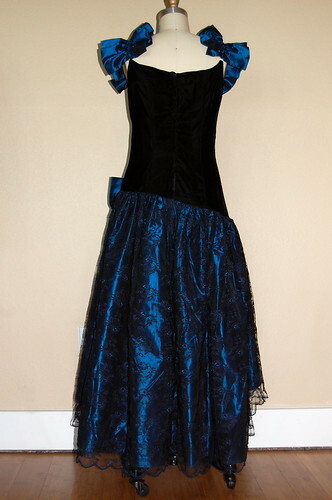 I'd lose the shoulder ruffles and replace them with rhinestone straps, small and delicate looking. Raise the waist, make it symmetrical, and put on a plain skirt, almost tulip shaped, tapered at the waist with darts, straight at the knee. I don't think I'd put a gathered waist on it. Whatever you decide, it will be fabulous. Looking forward to seeing how you refashion it! looking forward to seeing the refashion!!! Cool! I also love the sleeve ruffles! Can't wait to see what you turn it into... you always have the best refashions! Gawd, I'm just jealous you can fit into something from that long ago - when I find myself going up dress sizes like it's a race! My preference is for an empire waist bodice, but that's because I dress for my (lack of) waist. 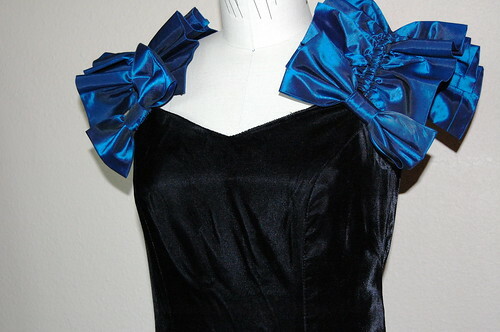 Or you could just use the bodice plus another fabric (in black, perhaps) - maybe make a corset - and use the blue stuff for something else entirely - like a mini dress. this feels like a project runway challenge!!!! i laughed out loud when i realized what you are doing. i would probably try adding some wispy silky fairy like sleeve things to it?? but i feel like my hippy-style is maybe different from yours....yeah, i would turn it into a fairy dress, somehow. maybe with a rough, hand woven skirt (like with strips of fabric just woven into a mat) attached on. i can't WAIT to see what you do. I can't WAIT what you do with this. It will be excellent. I feel sure that you should use the ruffles for um, er, *cough* some oooottthhher project. You'll do something wildly nifty. Looking forward to the update . . .
my only comment (since you have a lot of creativity when it comes to refashioning) is on the length - I'm sure you've already figure this out, but for us shorter girls, knee-length or above is always more flattering... I can see that frock turning into something gorgeous. :) good luck!